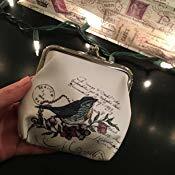 Keep your little valuables in this beautiful sparrow purse! I ABSOLUTELY LOVE this coin purse. It is plenty big to fit coins, cash, several cards and ID, and my chapstick. It's not too big to toss around in different bags, and the design is super cute! I'd highly recommend this product to anyone looking for a coin purse! I use it all the time, perfect size. stays closed and easy to open.